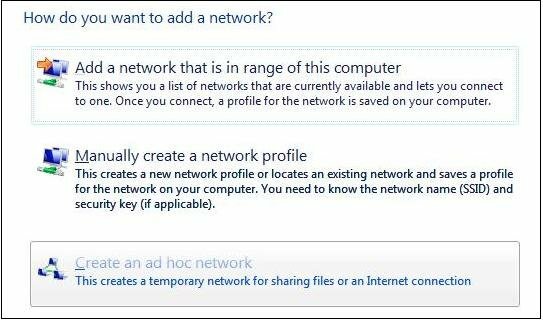 The Network and Sharing Center in Microsoft Windows Vista can be used to create a secure ad hoc Wi-Fi network. 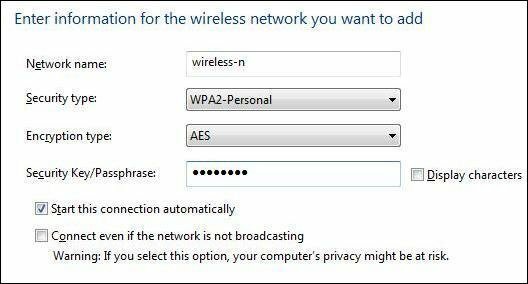 An ad hoc Wi-Fi network (also known as a peer-to-peer network) is a temporary network used when an access point (AP) or broadband Wi-Fi router is not available. It allows users to wirelessly connect directly to each other's mobile devices. 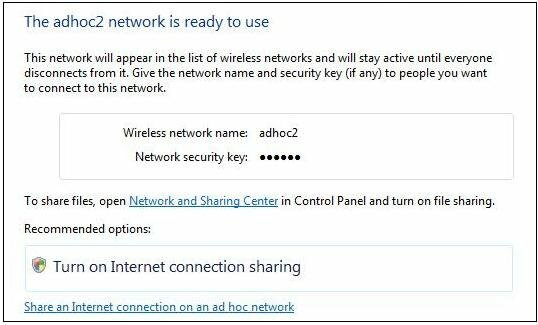 Follow these steps to create a secure ad hoc WiFi network from the Network and Sharing Center. 1. Access the Network and Sharing Center using Start » Network » Network and Sharing Center or another method. 2. Select Manage wireless networks. 4. Select Create an ad hoc network. Note: Many network names, known as SSIDs, have security enabled. Connecting to these networks requires that the user know the correct passphrase or preshared key. 6. Enter a network name. 7. Select a security type. 8. Enter a security key or passphrase. All users wishing to join the ad hoc network will configure their computers in the same manner. It is not recommended that you select Display characters because this selection will allow anyone around you to see the characters and will compromise network security. 9. Select Save this network if you wish to save this network for later use. The ad hoc network is now ready to use. You may choose to share files or turn on Internet connection sharing. If you return to Manage wireless networks at this point, you will see that the ad hoc network is now listed.